December 15th, 2018 –Just in time for the holiday season, Britannica Virtual Reality Science will be on shelves alongside the popular Britannica Virtual Reality Exploration. 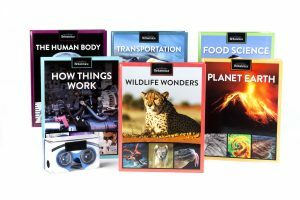 This expanded product line, developed in partnership with Publications International, Ltd., is a 6-book set that will awaken and inspire the scientist in children and adults. 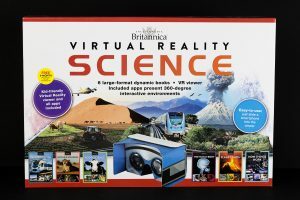 The Britannica Virtual Reality Science 6-book set includes vetted information from Encyclopædia Britannica plus a virtual reality experience. Each hardcover book is rich with full-color illustrations and photographs, lively graphics, inviting text, and videos. Also included is a 6-month free subscription to Britannica Online.